A couple years ago, I saw an unassuming little sign pop up in front of a house. Rhubarb. 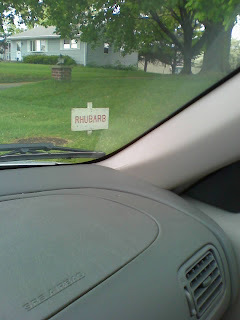 So one day I pulled in the driveway and knocked on the door and asked about the rhubarb. I could see an enormous patch in their garden. An old man, slightly bent, invited me inside while he went out to cut my order. Inside, his wife and I chatted, and she expressed some trepidation about how much longer he could "keep this up" what with the orders coming in from all the local produce stands, and all the work involved. It turned out, they are the rhubarb growers for most of the local area. What a wonderful blessing to find them. A week later I went back for a larger order, and they gave me their phone number. It sat in my car for a year, until the sign went up this week. Then, I called. The wife recognized me. "Your the girl who knocked on our door last year!" she smiled. No one has called me a "girl" in a good ten years. "The first cutting is always the best," she said. I told her that I still had a bit canned from last year, and she said that she does as well. I bet! In the Garden: A gaping hole where a head of lettuce had been. It looks like something swooped down and carried it off. A vegetarian hawk, maybe? Have loud music playing in the background. Don't identify yourself. Instead, ask "How are you today?" to which I will simply reply "fine" because I have no idea who you are. Ask me how to get your books into our library without identifying yourself as a author, distributor or publisher. Demand that we buy the book when I suggest donating a copy. Argue with me when I explain that purchased books must be ordered through our contracted distributor. Continue to argue with me when I explain that state law restricts how we can buy our media. Finally, reveal to me that you are a "publisher" who wants us to order from your "catalog." Never once turn down the music. Hi Beth! Let me know how it goes. I'm sure you'll do fine. And yes, don't be afraid to try canning, it's very simple once you learn the rules. Hot food into hot jars, then boil. I relay on canning because we don;t have one of those big chest type freezers, which would make everything easier if we did! But some things like applesauce, salsa, soup, jam/jelly, pickles, relish, you have to can those anyway. Obviously I meant "rely" on canning, not relay. I can no longer call you my sunflower friend. So are you a fancy hanky collector, too? I have a few in my dresser. One even has a little metal tab thingie. Not a fan of rhubarb, but can choke it down with lots of ice cream. We have chicken wire around our garden, but it wouldn't keep hawks out. I am sooo glad I do not work in the public, but hey, if we open a store, I'd have stories to tell. Did you have to take a deep breath after that? Just wondering how you canned your Rhubarb. 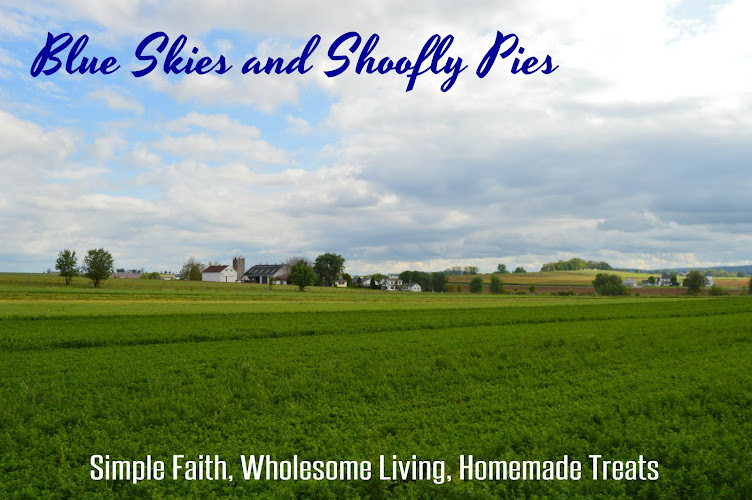 And do you just make pies with yours or do you have other good recipes? OK, whoopie pies are finished and in the fridge!! It was a great first experience because I did learn a few things: when you said drop by spoonfuls, you meant it! I used a BIG spoon and had a few whoopie pies the size of my head. I'll cut those in 1/4ths. The next batch I wised up and made them smaller - perfect; second, I did something to the filling like maybe use too much vanilla because that was a little bit off and I didn't beat the egg white enough, I know that. I used the right amount of vanilla at first but the bottle was almost empty so I just poured the rest of it in there. OK, don't do that! My mom always said not to mess with directions the first time. Finally, the batter is REALLY good (this is a warning) and I was constantly testing it to make sure it was still good (yep!) so by the time the whoopie pies were finished, I was sugared out and had to wait until this morning to eat one!! My family is scarfing them, so all in all I'd say it was a huge success. And actually, it was pretty easy - great tutorial! I can't wait to see what's next. Whoopie!! Michelle- I use the rhubarb canning recipe in the Blue Ball book of canning. If you don't have that book, I recommend you buy it. It's just a basic light syrup packed with the rhubarb pieces. There is a lot you can do with rhubarb, more than just pies. Beth- Great, glad to hear it! Those pies will last all of a couple days once they are discovered. The same thing happens to me- after all the work I'm too tired to eat one! Monica what nice folks.. And to remember thats good.. I hope your canning can out great.. Looking forward to hearing more about your rhubarb and garden.. baking and the whole blog..